Whether for corporate branding, recruiting, or lead nurturing, branded giveaways are an impactful tool for countless applications. Creative branded giveaway items can be used as means to turn valuable prospects into long-term clients or to acquire quality volunteers for an event. Whatever the purpose, BookWear® can help you custom-tailor the ideal branded giveaways to make your presence known and remembered. The most effective branded giveaways are not only practical items that individuals can use, but they’re unique gifts that offer profound levels of engagement, especially when delivered unexpectedly. BookWear® offers just that, and more. 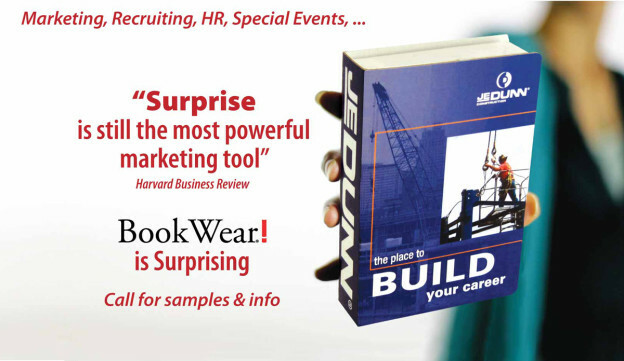 BookWear® is a “book” that embodies your brand and tells your unique story. The photos, graphics, and content of your organization are custom printed on the cover. Inside BookWear® is a surprise gift which can be a number of useful items, such as a compressed t-shirt, laundry bag, sunglasses, scrubs, socks, and more. But what separates BookWear® from other typical branded giveaway items is that it’s customized with your brand’s logo, design elements, messaging, and more. You can choose from 30 difference products to go inside BookWear®. Mail your branded giveaways to your recipients like a thick post card (see Turbo Tax bel0w). Your organization can do the mailing or you can let the staff here at BookWear® handle the process. Our primary mission is to fulfill every order with 100% customer satisfaction. Whether for recruiting giveaways for college students or as employee thank you gifts, BookWear® has helped make a variety of campaigns successful. When you choose BookWear® for your branded giveaway items, you get more than your average promotional products. You invest in personalized gifts that take the level of engagement to new heights. Our branded giveaway items leverage the power of surprise. When your recipients receive BookWear®, they’ll be compelled and engaged in your gift, and far more inclined to absorb your message. In essence, branded giveaways from BookWear® make a statement that gets acknowledged and remembered. In addition to offering an impressive selection of customizable branded giveaways, BookWear® offers a full-service team of creative designers, product support specialists, and customer service representatives to help ensure your investment yields optimal returns. Not only can the BookWear® team design your branded giveaway items just the way you want, but they also package any materials you want to include in each book and deliver them to your recipients. When it comes to corporate branded giveaways, BookWear® offers countless ideas for creativity. Customize your corporate branded giveaway items for any campaign, project, or purpose. Execute your own ideas and designs with full control, or recruit the skill-sets of BookWear® to handle the design work for you. Simply provide the creative as well as any additional items or brochures you wish to include. BookWear®’s plethora of branded giveaways for corporations range from quality pens, flashlights and flash drives to scrubs, t-shirts and hoodies. All of the items we offer can be custom-designed to reflect your branding elements. Learn more below about how some of our clients have successfully used BookWear® has corporate branded giveaways. BookWear® has helped many businesses and corporations with their branded giveaways. Many of them have been gracious enough to share their good experience. When it comes to effective Branded giveaways the generate positive outcomes and meaningful relationships, and BookWear® is the bee’s knees. Recipients of branded giveaways from BookWear® are often surprised, excited, and enthralled in what you have to offer. If this sounds like the perfect investment to ignite your campaign, than consider BookWear® as the perfect solution. 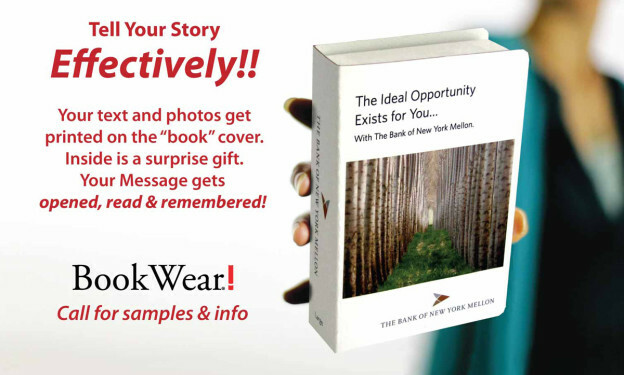 Discover the power of BookWear® for your next Branded campaign! Unlike some types of branded giveaways, BookWear® is a tangible and dimensional concept that offers limitless ideas to make novel impression. The cover is customized with your graphics and your unique message. Combined with the element of surprise, BookWear® is a compelling form of communication that cannot go overlooked. Traditional branded giveaway items are often stale and all too common, thereby lacking novelty, excitement, and effectiveness in their purpose. To truly connect and resonate with your target audience, you need some creative, unique, and interesting. BookWear® offers the foundation to make a meaningful connection, enabling you to get your message across in an amusingly offbeat way. So don’t settle for generic giveaway items. Strike a chord with each and every recipient, and invoke feelings of inspiration and enthusiasm for your cause by using BookWear®. 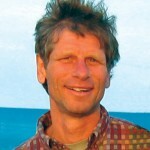 Jack Gyr is the founder of BookWear®. He has helped countless colleges and universities develop highly effective college student recruiting gifts and giveaway ideas using BookWear®. You can reach Jack by contacting BookWear® directly, or connecting with him on Facebook or Google+.